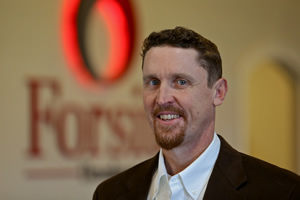 Tom is the President / founder of Forsite Development, Inc. and manages all aspects of the company’s operations. 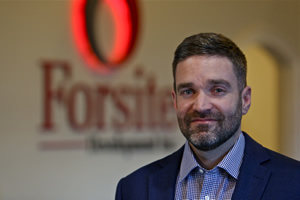 Tom started Forsite in December 2004 with the idea that there was a significant supply of vacant corporate surplus industrial facilities throughout the Southeast that could be acquired aggressively and then repositioned. Since starting Forsite, Tom has purchased over 7 million SF of space throughout the Carolinas. Forsite’s most ambitious project to date is “ReVenture Park”, a 667 acre re-development of a shuttered chemical plant, currently listed as a Federal Superfund site into a “Renewable Energy Industrial Park”. The property, located along the shores of the Catawba River in Charlotte, NC has over 1.4 miles of river frontage and is the largest piece of underutilized heavy industrial property in the region. Once complete, this project is projected to create over 1,100 “green collar” jobs and over $900 million in new investment. Prior to starting Forsite, Tom was a ten year veteran and Senior Vice President of Development for Indianapolis based Lauth Property Group. In July of 2001, Tom moved to Charlotte to open Lauth’s second regional office where he managed all build-to-suit, land development and construction activities that he and his team created in the Southeast. Houston oversees all aspects of Forsite’s development and acquisition projects. Houston brings Forsite an exceptional understanding of industrial real estate and numerous relationships he has built over his 18 year career in the Carolinas. His background integrates work in all the industries disciplines, including: building acquisition, development, financing, brokerage, marketing, construction, asset and property management. Prior to joining Forsite, Houston served as Vice President of Office and Industrial development for Lauth Property Group. He had overall responsibility for Lauth’s Office and Industrial development in the Carolinas and Virginia. While at Lauth he participated in eight development deals representing a gross value of $254 million. Prior to joining Lauth Houston served as Project Manager for American Asset Corporation. While at AAC he managed the development of 9 speculative retail, office, and industrial buildings totaling $95 million in worth. His real estate career began with CB Richard Ellis as an industrial broker where he participated in over 200 transactions. Houston has a Bachelors degree in Corporate Communication and Business Administration from the College of Charleston and a Master degree in Real Estate Development and Finance from Harvard University. Prior to forming Forsite Capital , Abrahm was a founding member of Gulf Stream Asset Management. Started in March 2002, Gulf Stream was a Charlotte, NC-based manager of corporate-credit assets where Abrahm headed the trading side of the business and directed market strategy for the firm. Gulf Stream was sold to Apollo Global Management in October of 2011. Abrahm previously served as the Head of Syndicated Loan Finance and led the Loan Sales & Trading business at Wachovia Securities, which he joined in 1993. After receiving a Bachelor of Science degree in Business Administration from Georgetown University and an International Business degree from Nijenrode University in the Netherlands, Abrahm joined Chemical Bank (formerly, Manufacturers Hanover) in 1989 where he joined a team within the Leveraged Finance lending division. 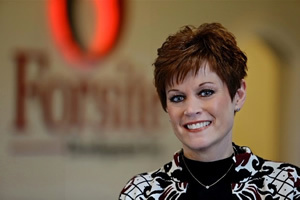 Forsite Development day-to-day operations are managed by Shannon Doster. Her responsibilities include financial reporting, executive support, human resources, marketing, and property management administration. Offering over 15 years of experience in business management, accounting, sales and marketing along with her previous job for an international corporation, has gained Shannon experience in many business sectors. This coupled with her versatility has contributed much to Forsite ’s ongoing success. Shannon studied Business Management at York Technical College. She has special training in Six Sigma quality and has earned a Green Belt Certification. Shannon is also a licensed Real Estate Broker and is a Notary Public for North and South Carolina. Ryan is responsible for the operations and project management of Forsite’s risk transfer business. Ryan’s background is in Engineering; specifically, large scale engineering, procurement, fabrication and construction (EPFC) projects. Ryan has spent significant time on major construction sites, supervising installation of the design of new construction including coal, combined cycle and nuclear power plants. Additionally, Ryan has worked in various engineering management roles within the power industry focusing on all fuel types for major base load plants, including the newer Allam Cycle technology. Ryan has a Bachelor’s degree in Mechanical Engineering from Virginia Tech and has completed various Energy Leadership training including E4 Carolina’s Emerging Leader program. Greg represents the perfect blend of mechanical practical ability and theoretical engineering acumen. A native of Northern Australia, Greg was compelled to hone his mechanical skills keeping farm equipment operational in harsh conditions. Additionally, this mechanical ingenuity led Greg to study Engineering and pursue a career in the consulting business with companies such as URS and Geosyntec. Greg is the Technical Director for all of Forsite’s endeavors including power, wastewater, construction, decommissioning, demolition and environmental liability projects. Van Morris joined the ReVenture Park team two years ago and is primarily focused on all of the project’s technology and business aspects. 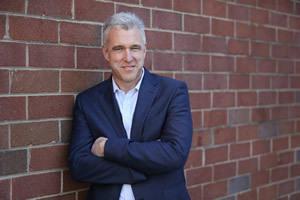 Since 2001, Van has been heavily involved on progressive energy technologies and techniques as Co-Founder of MicroGrid. Van Morris has spent his career working with industries and companies at the inflection point of technology commercialization and expansion. Prior to founding US MicroGrid, Van was CEO of Infonautics.